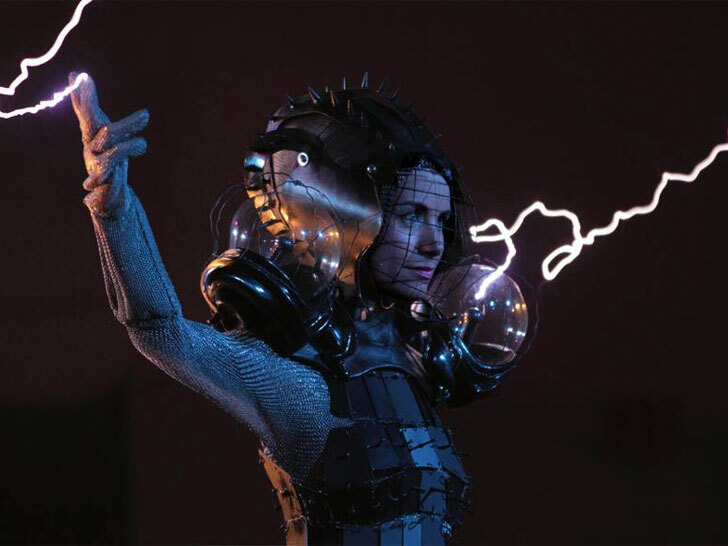 Dutch designer Anouk Wipprecht's "Faraday Cage" dress is electrifying—in more ways than one. Comprising metal plates, 600 rings of chain mail, "plasma ball" epaulets, and a spiky grilled helmet, the Hellraiser-esque garment is capable of conducting close to a million volts of electricity. Wipprecht gave a demonstration of her creation at Maker Faire in May, wearing the dress herself since the models she usually works with turned her down. Standing stalwartly between a pair of Tesla coils, electricity arcing around her to the strains of In the Hall of the Mountain King by ArcAttack, Wipprecht remained safe in the confines of her homemade Faraday cage, which distributed the electrical charge around its exterior while shielding the contents within. “The first time that the arcs hit me fully on stage was very scary, but incredibly interesting being in contact with such a free and pure form of electricity,” she wrote of her experience on Instructables, where she describes the process of constructing the dress. “All went good and no humans got broken during the process,” she added. For the foolhardy who will not be dissuaded, she has one remaining piece of advice. “Don’t wear this dress to a bar, as sitting was impossible with the metal plates,” Wipprecht said. I�d rather they made a Kilt version along with a chainmail jockstrap where you shoot lightning bolts off your willie! "The first time that the arcs hit me fully on stage was very scary, but incredibly interesting being in contact with such a free and pure form of electricity," she wrote of her experience on Instructables, where she describes the process of constructing the dress. "All went good and no humans got broken during the process," she added. Despite the tongue-in-cheek title of her post, "How to Get Fashionably Struck by Lightning," Wipprecht cautions amateurs against trying the same at home. "If the arcs raise through your heart, you might not live to tell, so if anything, this process was done very carefully," she said. "ArcAttack have been doing this for over 12 years and are specialists in their field." For the foolhardy who will not be dissuaded, she has one remaining piece of advice. "Don't wear this dress to a bar, as sitting was impossible with the metal plates," Wipprecht said.